Guimaras is located at the Heart of the Philippine Islands, in the center of the Western Visayas Region. It is an Island province famed for its lush greenery, warm smiles, sandy beaches and most of all, its World's Sweetest Mangoes! I, together with My Dad, my cousin Judy and three of my lifelong friends RJ, Myrcel and Ivy have been lucky enough to get to this paradise in such fine weather which enabled us to get from the uppermost tip to the bottom part of the whole Island. Guimaras Island Getting to Guimaras from Manila requires you to fly to the City of IloIlo, one of the largest and oldest cities in the Philippines. We took the very first airphilexpress Flight to Iloilo that leaves Manila at around 4:45 am and arrives at IloIlo at 5:45 am. Then upon arrival at the airport, ride a van that will take you to Ortiz Port at the edge of IloIlo City which will cost 70 pesos per head or if you happen to be a group, it is very comfy to hire the entire van, which we did, and it costs 500 pesos per van. From Ortiz Port, you will ride a medium sized motor boat which will take you directly to the Ports in Guimaras whether it is in Jordan Port or at Buenavista Port. The Boat we rode, the Cena Love, brought us directly to Buenavista Port. The 15 minute ride costs 15 pesos per head. Very cheap it is! As we have read from other travel stories, the ride from IloIlo to Guimaras may be short but for them, it seemed like the longest due to the massive waves that they faced. But in our case, the sea was very calm and serene! 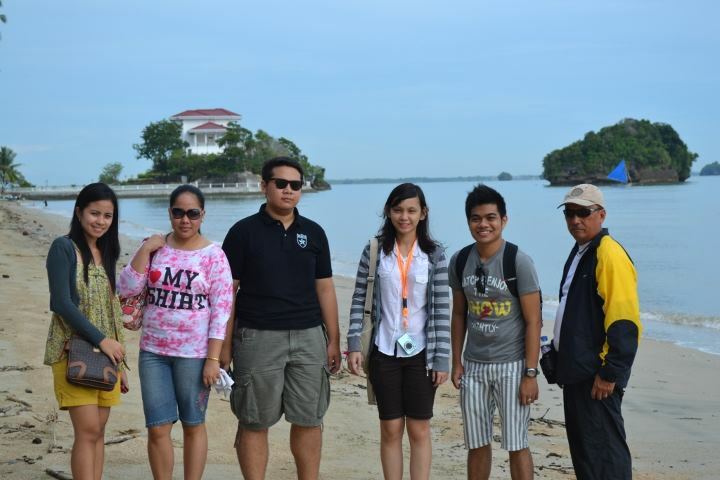 Feeling the morning breeze of the sea felt very relaxing, it replenished us even if we haven't got sleep yet. After exactly 15 minutes we arrive at Buenavista Port. It was really a cool morning and most of us are quite awed to see how near Guimaras is to IloIlo because from the port, you clearly have a view of the Port Area of Iloilo from a distance. 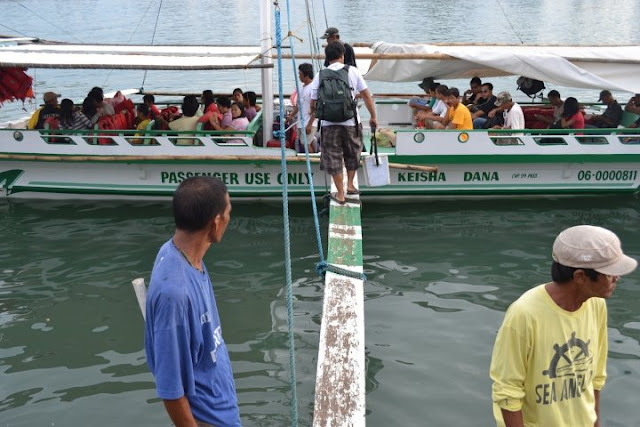 People from Guimaras, bound to Iloilo have been flocking up the boats going back to the City to commute for work and school. An indication of how early we were in Guimaras is that the Newspapers from Manila are being delivered on the same boat that we took to the island. While we were waiting for Kuya Cherald to arrive at the port, (because we were supposed to ride a boat to Jordan Port but the boat took us to Buenavista so Kuya Cherald rushed back to Buenavista Port to see us) I saw the Tourism Building just at the entrance of the port. I decided to ask for some maps to keep and there was this young and friendly Policeman who was very nice to give me a lot of maps and brochures. The older Police officer even told us to sit in the police shed while we wait for our Tour Guide. 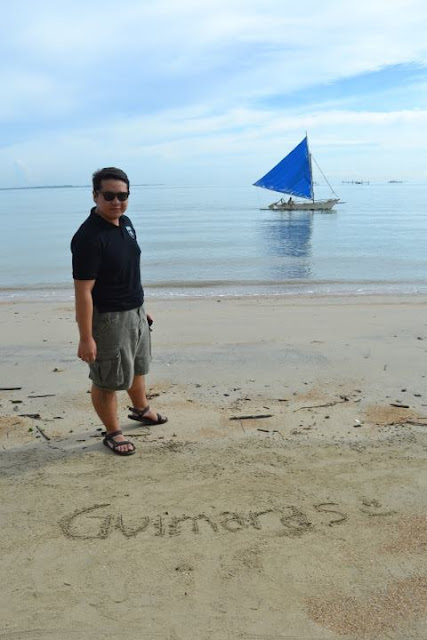 Then I knew how nice the people of Guimaras are! They really are welcoming especially to travelers like us. One of them even recognized I'm a La Sallian because of my shirt and he told me how sad he was about the defaet of the La Sallian Team in the last UAAP Basketball Season. 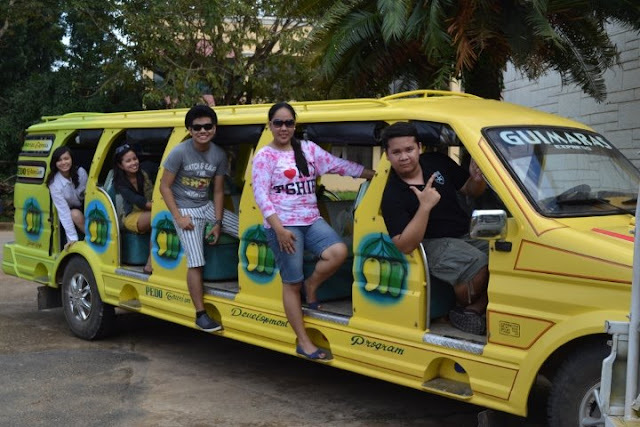 Travelling around the Island of Guimaras requires you to rent a tricycle or for a larger group like the six of us, it would be wisest to get a Multicab. 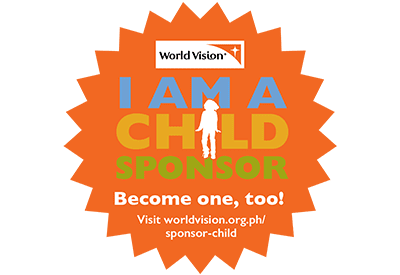 So from another blog that my cousin Ate Judy have read, we decided to contact Kuya Cherald, A native of Guimaras which gives trips around the Island. We called him up and after some arrangements he asked us about our date of arrival and then when we arrived at the Port, He went to fetch us together with the driver Kuya Neng! Our First stop was the McArthur's Headquarters. This was McArthur's and his men's headquarters in the Island during the Second World War. 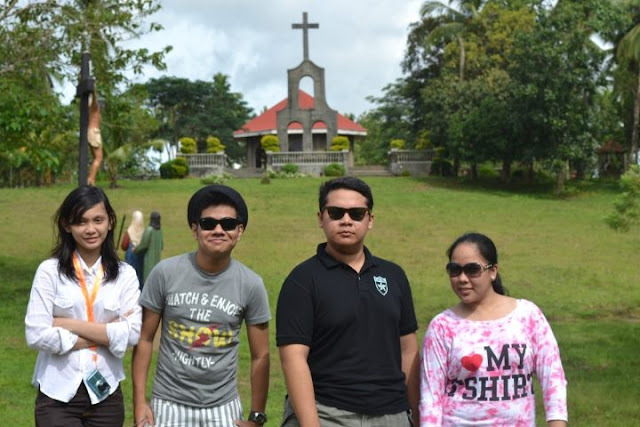 Kuya Cherald took a photo of us six and I have to say he does know a lot about taking great shots! He told me that once he gave a tour to a photographer around the Province and He tought Kuya Cherald a lot of tips on how to take great shots and how to use DSLR's in the best possible way! Whoever this Photographer is, He was really nice and he did a great job teaching Kuya Cherald! Navalas Church, Guimaras After the Headquarters, we then rode a quite a bumpy ride to the next Destination, Navalas Church. 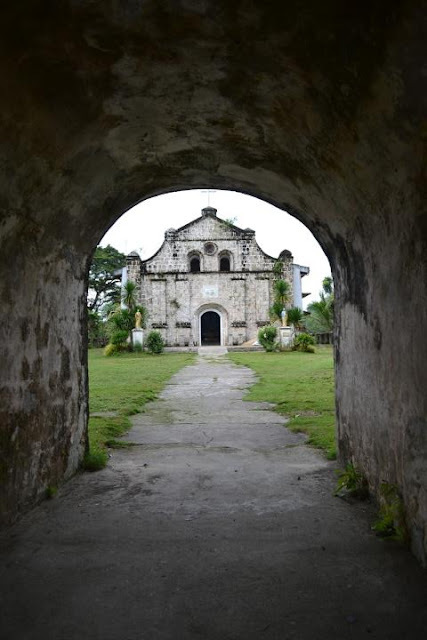 Navalas Church is the oldest building in the whole of Guimaras. It was built in 1880 and is also known as the San Isidro Church. There was a massive 4 way arch in front of the church that led to the magnicficent facade of the structure. It was magical I must say. Roca Encantada As we left the Church, we then go to the beach not for a swim but to see the Roca Encantada, A house built on top a rock by the beach. The sight of it just makes me sing the song we sung at Kindergarten about the wise man who built his house upon a rock. 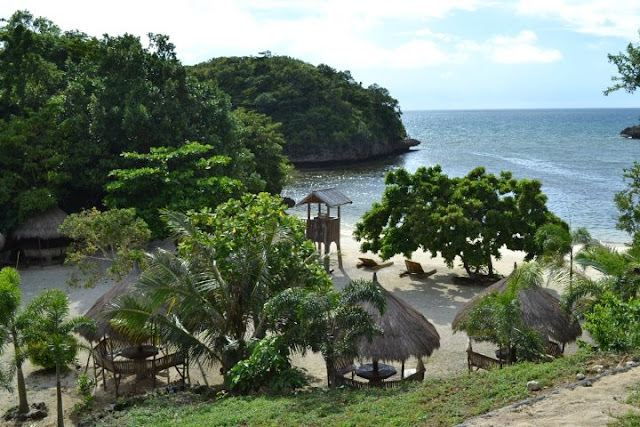 Situated at the northermost tip of the Island of Guimaras in the town of Buenavista, Roca Encantada is owned by one of the richest clans in the country, the Lopezes. Roca Encantada means Enchanted Rock in English and it does have a great view of the Las Islas de Siete Picados which are seven islets scattered along the Guimaras coast. 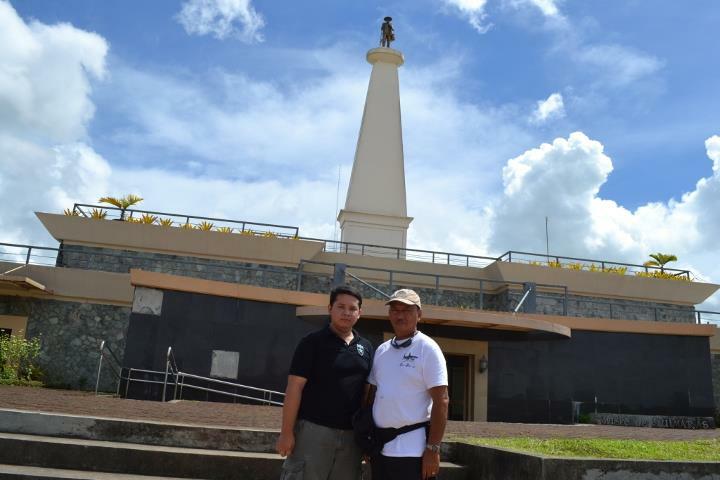 Then it was time for a real long ride, we went to the heart of the Province in the Town of San Lorenzo in Baranggay Tamborong wherein the Shrine of the Holy Family is situated. It was a very long ride and since the multicab has open windows and the wind that comes in is just so fresh, I have slept all the way to the Shrine. We were all laughing because we found out that it was not just me or my friends who got a little drowse but Kuya Cherald our Guide as well! We then arrived at the shrine and it was beautiful! It features larger than life size versions of the depictions of the Station of the Cross and at the top of the hill is a massive Statue of the Holy Family on top of a Marble-like Gazebo. You can see a clear view of the whole shrine at the top and even at the beautiful mountains and streams that are just behind the area. We were very lucky enough that even if the Shrine is still closed to the Public, Kuya Cherald knows the people behind the shrine that granted us a visit. But I do encourage to give some donations for the maintenance of the Shrine. It was time for a quick halt to have some brunch and to visit the Capital of the province, Jordan. We stopped by a small restaurant. I decided to have some sisig it was spicy and it was really good. I can tell that it was the best Sisig I have ever tasted in my life. My friends had some Beef steak and some Soup. After brunch we headed for our next destination. 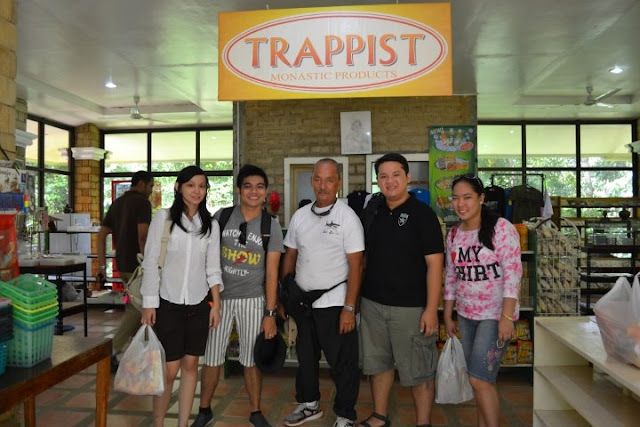 Just before making it to Sibunag, we stopped by the Trappist Monastery to get some Pasalubong. The Trappist Moks are really the ones who harvests, cooks and makes their products. There are 27 Monks according to Kuya Cherald and their products range from Mango Bars to Mango Juice, Mango Piaya to Mango Candies, Mango Soap to Mango Otap. Evrything is just about Mangoes which is so delightful because even as a kid, Mangoes are my Favorite fruit! After buying a lot of Mango goodies, Kuya Cherald took a shot of us inside the store before we left. We then went back to the cab to go all the way to our next Destination, the Guisi Lighthouse. As most of my friends know, I am crazy about Lighthouses! How tall they are and how sturdy and strong they are yet their purpose can never be measured. On the way, we stopped by a scenic resort just by the road, Valle Verde Resort to take some pictures. At that place, you can really have a great view of the Southern part of the Island. I can see a beautiful Bay that protects the inner beach of the coast. 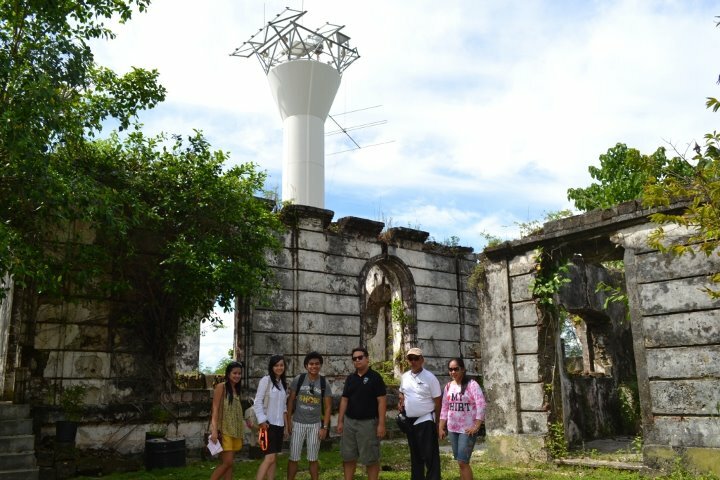 After a few shots and a bottle of water, we then headed south to the Guisi Lighthouse. The road to the lighthouse was a bit bumpy. There were houses along the road and friendly natives wave and greets us as we pass by. As we arrived at the site, we walked about 50 meters until we finally see the Lighthouse. I was astounded by what my eyes are seeing. The lighthouse that is so old and rusty which I only see on Magazines is now right in front of me. It was very touching. We then headed near it and we also saw the newly installed lighthouse right beside the old one. The lighthouse was built along the rocky cliffs of the southern part of the Island. The rusty lighthouse does not function as a lighthouse anymore but more of a historical attraction. 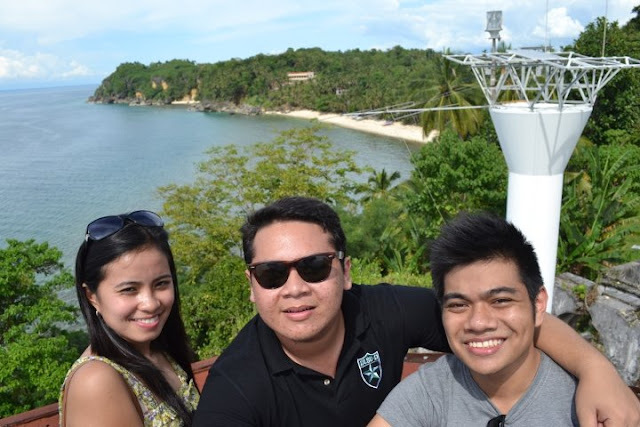 Kuya Cherald went up to take a shot of us from his perspective. He encouraged us to get up there with him but we are quite afraid. I know I somehow conquered my fear of heights when I Skywalked Cebu but climbing this lighthouse was quite a different story for me because I have to be honest, I got so much weight and I got a feeling this old rusty lighthouse might collapse. Ok that was hilarious but when Kuya Cherald called me and asked me again, I did agree and I finally went up. It was quite disturbing up there because there were no railing around the top. It's just you and around 2 meters of metal plank flooring. But Kuya Cherald was very nice and he would really guide you along while he take some photos of you. Here is one of my photos. My friends Ivy and RJay decided to go up as well and after a few shots they went down. Before I did, I took a shot of Kuya Cherald too While he we were up there. Kuya Cherald or also known as Kuya Gerald is a Tricycle Driver yet his Tour Guiding skills is very remarkable! He is a very good speaker and he knows everything about his Province really well! He is probably one of the Best Tour Guides I ever had because He is very informative about the history and the current events of his hometown, he is very caring of his travellers and most of all, he take great shots of us! He is always I would really really recommend him to everyone! You can reach through his Cellphone Number 09084748122. 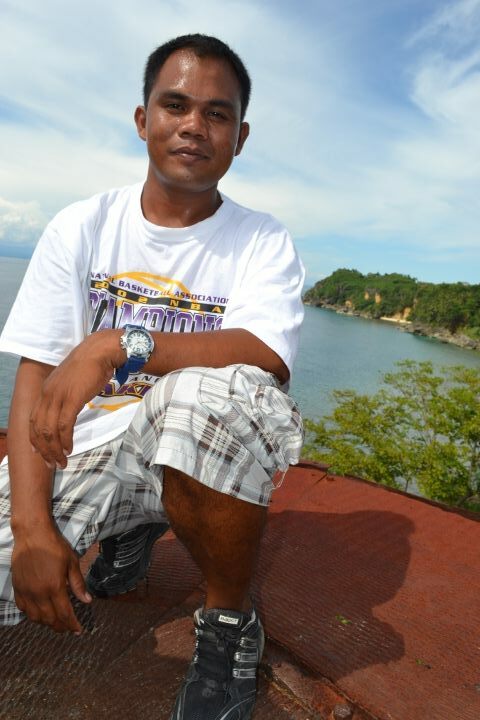 So if ever you have plans of visiting Guimaras, He is the Man! After the Lighthouse we were finally up to our last destination for the Day, La Puerta Al Paraiso, the resort where we will be spending the night. We got a fan room for 6 people, 3 double beds which is really comfy. Yes you do not need Air conditioning because the sea breeze is quite cool especially in the evening but the only thing to remember are the Mosquito attacks so better get ready with your Insect Repellent lotions.The view from our room is just Spectacular feels like there's a giant billboard of a Resort Add right in front of you. The best thing about La Puerta and our Time there is that there are probably just 20 guests throughout the Resort and it feels so exclusive as if we have rented the lot for our own. 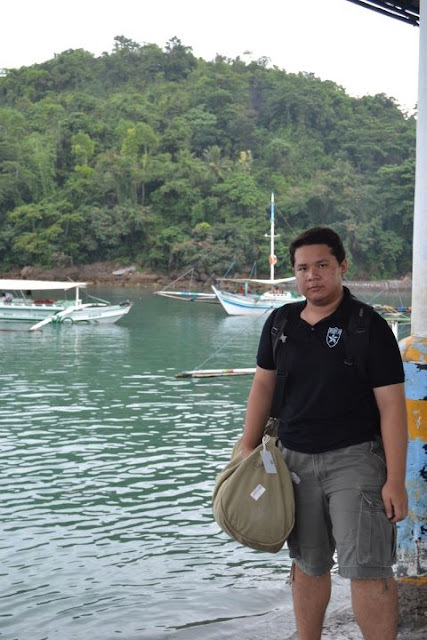 Guimaras is truly a Wonder of Nature. 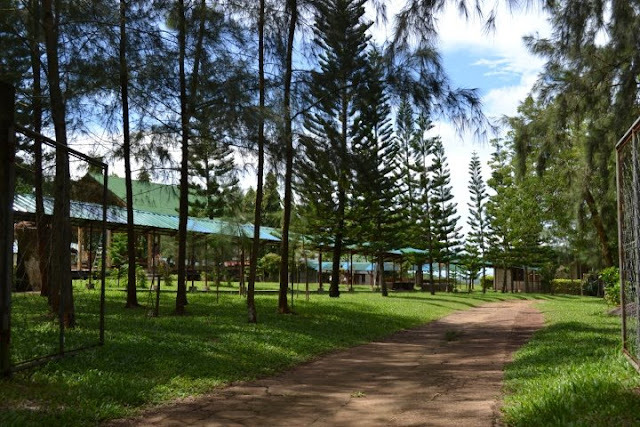 The name of our resorts does not just describe the resort itself but the whole island in general. It truly is a Gateway to Paradise or might I say It is PARADISE in itself! 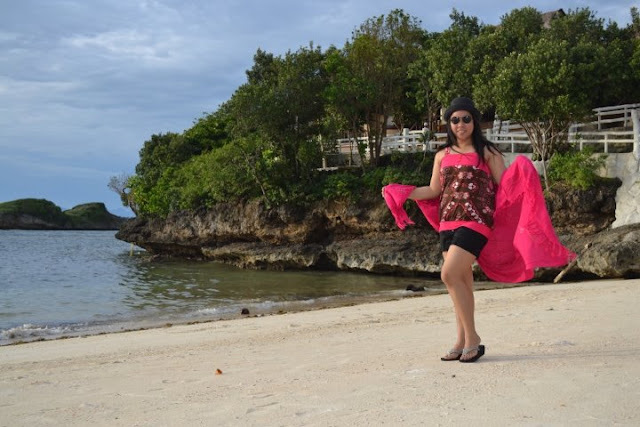 Beautiful Scenery, Freshest food, Gigantic Sweet Mangoes and my favorite thing in every travel, Wonderful Natives that makes Guimaras truly a Magical Destination!